First Taulinoplastia in Portugal, conducted by Dr. Abel Nascimento. Ventura Medical Technologies closes 2017 with a new Pectus Up Surgery Kit intervention in Portugal, in the Instituto de Cirurgia Reconstrutiva in Coimbra. The surgery was performed last 5 December by Dr. Abel Nascimento, director of the Instituto de Cirurgia Reconstrutiva, integrated in Idealmed, a well-renowned international group made up of over 500 doctors from different specialties. The the Instituto de Cirurgia Reconstrutiva treats patients from all over the country, as well as other European states, thanks to its high profile in outpatient surgeries or with short hospital stay. The institute consists of three specialized surgeons, two house surgeons and two anesthetists. Its Director, Dr. Abel Nascimento, is the Orthopedics and Service Chief in Coimbra Univeristy Hospitals (HUC) and Professor in the Factulty of Medicine. 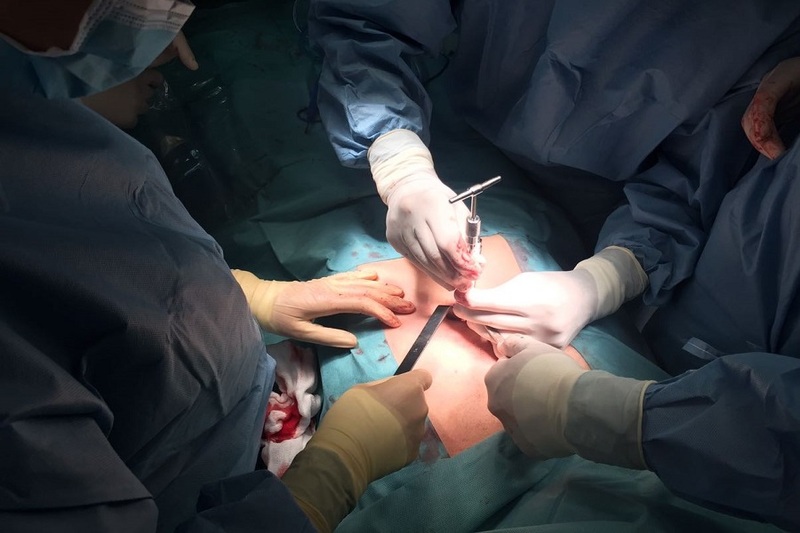 Orthopedic surgeons since 1984, Dr. Nascimento operated on a 19 year-old patient, the first time for the Pectus Up Surgery Kit in Portugal, with excellent results. Once again, the Pectus Up Surgery Kit, developed by Ventura Medical Technologies, has crossed borders landing this time in Portugal, the third European country to perform the Taulinoplastia as a means to fix the Pectus Excavatum, the chest wall deformity also known as funnel chest. This innovative intervention is minimally invasive, has a much shorter recovery time than traditional techniques and is being successfully performed for the last two years. Taulinoplastia with Pectus Up is a great alternative to more invasive previous methods, and that is why more and more surgeons worldwide are becoming interested on it. Besides Spain, France and now Portugal, the Pectus Up Surgery Kit is also being marketed in Colombia and is currently in the process of registration in Italy, United Kingdom and Mexico, where it will be available for surgeries after the relevant training phase by surgeons willing to treat their Pectus Excavatum patients with this new technique.